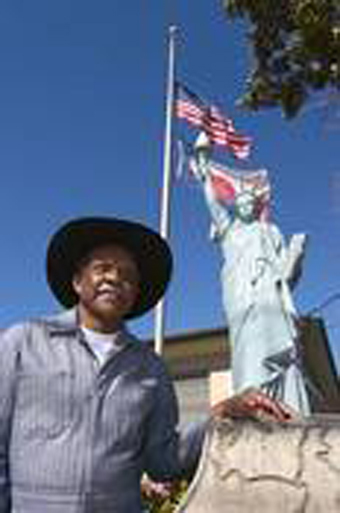 In 1987, citizen Ira Poole held a press conference in his front yard along Martin Luther King Jr. Boulevard for the dedication of a new Austin monument. In a town where residents sculpt giant blue genies and spray-paint their lawns with polka dots, a bit of yard art wasn't unusual, but it was perhaps the first time anyone had invited the local news to cover its inauguration. Unlike most others, though, Ira's display had purpose. A man proud of his country, he had assembled a commemorative to the bicentennial of the U.S. Constitution. As he wrote in his press release, he wanted to honor "the most famous document ever written in the history of the United States." He unveiled the monument on the Fourth of July. "This represents all the symbols of the United States," Ira explains. 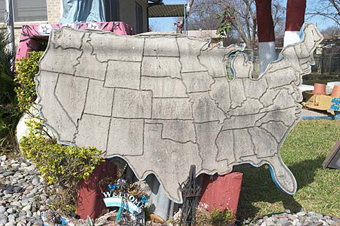 Cast in concrete is the continental U.S., bounded by rock beds denoting the Pacific and Atlantic oceans. Towering above them is a model Statue of Liberty Ira picked up from an antiques dealer, and behind that flies Old Glory. A waterfall beneath Lady Liberty stands in for Niagara. At the edges of the display are a braided hibiscus and a smallish boulder. "This is Hawaii––this represents Hawaii out in the Pacific," Ira explains of the tree. "The big rock is Alaska." There's also a slab in the shape of Mexico. It sports a tiny bullfighter. Planted at the other end of the yard is a 900-pound scale Sphinx, an unrelated item Ira made in the 1970s. It was molded from a model he and his students built when Ira taught the fifth grade. 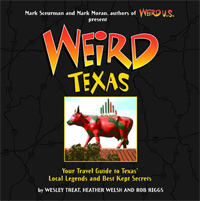 It rests on a foundation shaped like Texas. Originally, Ira wanted to construct his Constitutional tribute as a class project. "I was going to do it just like I did working with the kids making that sphinx… I was just being patriotic and teaching the children." The staff, strangely, couldn't see it that way. They said no. "They didn't want me to do it there. They thought I had some kind of political ambition." So, Ira figured, "If they don't want it, I'll just put it in my yard."